The best breakfast, lunch and dinner for losing weight is the meal you take time to plan. When struggling to drop unwanted pounds, half the battle is knowing what you're going to eat in advance. Speak with your doctor or dietitian to help you design a weight-loss plan that fits your needs and food preferences. Although a number of diet fads state that they can help you lose weight, generally they have one thing in common: they reduce your daily caloric intake. The only way to lose fat is to eat fewer calories than your body needs. Eating 3,500 fewer calories a week -- or 500 calories per day -- can help you lose a pound a week. Estimate the number of calories you need to lose weight by tracking what you eat, and subtracting 500 calories from that number. For example, if you are eating 2,200 calories a day to maintain your weight, limiting your daily intake to 1,700 calories a day will help you lose a pound per week. To lose weight, it is important to limit your daily caloric intake to 1,200 calories to 1,800 calories a day, although this quantity varies, based on gender and activity level, according to the National Heart, Lung and Blood Institute. Calories are not the only thing you need to take into account when trying to eat the best meals to lose weight -- what kinds of foods you eat is also important. Foods high in fat and sugar are also high in calories. A better meal plan is one that includes mostly low-calorie foods that are rich in the nutrients your body needs. This means that you need to go back to the basics: fruits, vegetables, healthy whole grains and nutrient-dense proteins. For hunger management and energy balance, each breakfast, lunch and dinner should have about the same number of calories. Set aside time one night a week to plan your weekly menu so that you know exactly what you're going to eat at each meal, which enables you to prepare the meal properly. It might also help if you prep your meals in advance, which helps prevent last-minute temptations. Make breakfast a priority. Eating breakfast when you're trying to lose weight not only helps prevent you from overeating at your next meal, it also improves mood, concentration and memory, according to the Academy of Nutrition and Dietetics. Eggs make a good breakfast choice, and may help your weight-loss efforts by keeping you full longer, according to a 2008 study published in the International Journal of Obesity. 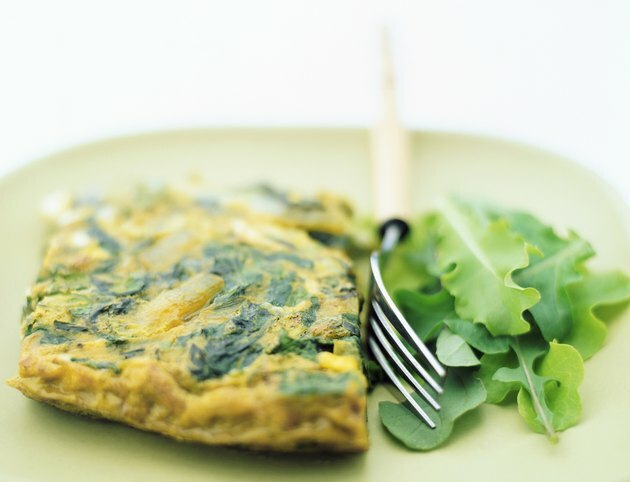 For 480 calories, you can have a two-egg omelet stuffed with 1 ounce of low-fat cheese and 1/2 cup of spinach, and served with two slices of dry, whole-wheat toast and a 6-ounce container of nonfat yogurt. If you don't have enough time for a sit-down breakfast, consider having a toasted English muffin with 2 tablespoons of peanut butter and a large banana, for a total of 470 calories that you can easily pack into a lunch box to take with you. When it comes to losing weight, lunch doesn't get as much attention as breakfast, but having a good lunch might help you get through the afternoon without hitting the vending machine. A good weight-loss lunch might include a 6-inch corn tortilla rolled with 3 ounces of turkey breast, lettuce, sliced tomato and mustard, served with 2 cups of vegetable soup, a small apple and a 6-ounce container of nonfat yogurt, all for 485 calories. Or, try a pasta and bean salad made with 1 cup of cooked, whole-wheat penne pasta tossed with 1/2 cup of kidney beans, 1 cup of cooked mixed veggies, such as carrots, broccoli and cauliflower and 2 tablespoons of low-fat vinaigrette, served with a small orange, for 470 calories. To make it easier for you to stick with your weight-loss diet at dinnertime, be sure to keep your kitchen stocked with healthy foods you can assemble in a pinch. A chicken stir-fry made with 3 ounces of chicken breast sautéed with 2 cups of mixed veggies, such as red peppers, mung bean sprouts and Chinese cabbage, 1 teaspoon of vegetable oil and low-sodium soy sauce and served with 1 cup of cooked brown rice, makes a quick, low-cal dinner of 490 calories. Or, top off a large baked potato with 1/2 cup of vegetarian chili and 1 ounce of low-fat cheddar cheese and serve with 2 cups of mixed greens topped with 1 tablespoon of low-fat salad dressing and six chopped almonds.